This Paella with Pork and chorizo is, without a doubt, the perfect one for meat lovers. 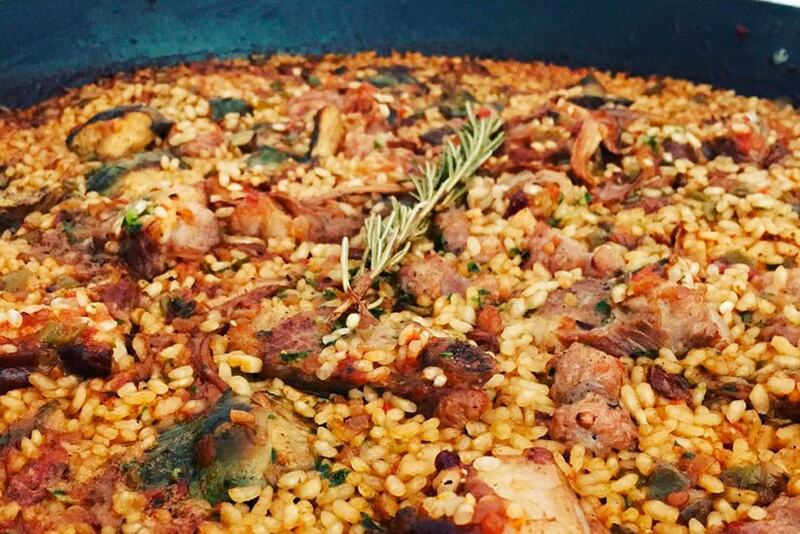 Meat paellas can have different types of meat, such as chicken or beef, but I like it best with a chopped pork loin and chorizo. The best thing about paella is that it admits any ingredient. You can add peas, green beans, other types of meat, whatever you want really. To know which paella rice to buy in Coles read the article at the bottom of our home page! Start by heating the oil in a paella pan (or frying pan) over medium heat. When it is hot, add the chopped chorizo and fry it until it browns on both sides. Stir as often as necessary to infuse the oil with the flavor of the chorizo. Then remove the chorizo to a plate (you can put it on top of kitchen paper to drain the excess fat), and add the pork to fry it in the same way. When it is golden brown, remove it from the same dish as the chorizo. Now, in that meat flavored oil, sauté the chopped capsicum until it begins to soften, then add the garlic and let it sauté as well. Next, blanch the tomatoes in boiling water and crush them. Add them to the frying pan to cook for 7 or 8 minutes. When the liquid of the tomatoes begins to thicken, pour the broth and increase the temperature so that it comes to boil. Then add the saffron, salt, black pepper and add the meat again. Add the paella rice and stir once so that the liquid covers all the rice. Now lower the temperature and let it cook over medium-high heat for 10 minutes. After that time, turn the heat to low and continue cooking for another 10 minutes until the liquid has been completely absorbed. To finish, turn off the heat and sprinkle the paprika on top. Cover it with a cloth or aluminum foil and let it rest for 5 or 10 minutes. We can decorate the paella with a few slices of lemon.